Old time hard Christmas Candy. 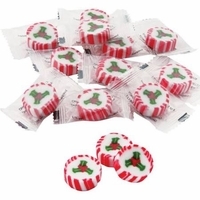 Delicious peppermint flavor with a holly design in the center. These are individually wrapped making them great to place in your candy dish. Add some peppermint flavor to you holiday cookies or brownies. Just crush up the candies and add them to the batter for a cool minty flavor. Each bag is one pound , approximately 110 pieces.